Learn how to remove, delete, change, manage, view saved passwords in Mozilla Firefox web browser in Windows. Lot’s if time when we read articles about security it is mentioned that don’t save password in browser . After reading this article you will never save your password. Because this trick is about how to know saved Password in your Firefox browser. Learn how to manage passwords in Chrome here. This tip is specific for Firefox, you should state that in the post title, or give step by step instructions for all browsers. Firefox itself provide this feature. All you need to do is to Open Firefox -> “Tools” -> “Security“. Then click on “Show Passwords” button. A small window will appear giving information regarding Website Name and their respective Username. Click again on “Show Passwords” button and all your saved passwords will appear. Lot’s if time when we read articles about security it is mentioned that don’t save password in browser . After reading this article you will never save your password. Because this trick is about how to know saved Password in u r browser. 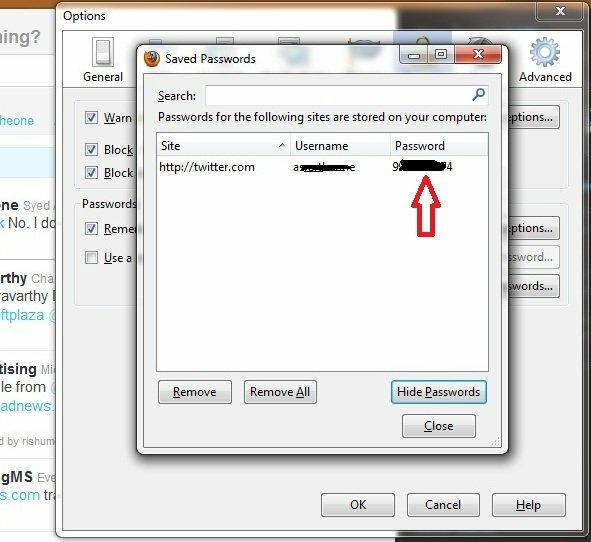 what is wrong about saving passwords in the webbrowser on your OWN computer ? but of course you should NOT save any passwords if you are using a PUBLIC computer at fx. a internet café. and you should clear the cache and delete all cookies, if the computer isn´t set to do it automatically. nothing is saved on the local computer, everything is on the server. fx. i never logout from any of my forums or websites when i´m at the university, so next time when i login on the computer i´m still logged in at this forum ! it´s very practical as it saves me all the trouble of logging in at differrent forums etc. and this is SAFE, as no one except myself (and the admin) can login on my computer-account at the university. Last edited by hackerman1; 18th September 2010 at 04:30.